Using motorsports as a proving ground for more than 30 years, BFGoodrich Tires is involved in every type of racing, including oval, sports car, drifting, drag, desert, dirt, rally and extreme rock-crawling. BFGoodrich Tires combines technological expertise with vast motorsports experience, delivering a high-performance tire for every type of vehicle. BFGoodrich Tires is preparing for its 23rd victory in 24 attempts at the granddaddy of off-road races, the SCORE Baja 1000. The 42nd running of the most well known of all desert races will begin on Friday, November 20 and end on Saturday, November 21 in Ensenada, Mexico. More than 325 racers will attempt to master the rugged terrain and dethrone last year’s Baja 1000 champions and BFGoodrich Tires’ drivers Roger Norman and Larry Roeseler by taking home the overall title. BFGoodrich has raced the SCORE Baja 1000 for 34 years in order to prove the extreme capability of our tires,” said Roberts Kukainis, Motorsports Manager, BFGoodrich Tires. "The Baja T/A tire may grab the headlines, but a majority of our wins come from racers who compete with tires that are available off-the-shelf. That off-road BFGoodrich tire on your truck has won the SCORE Baja 1000. That’s proven, extreme capability in tires recognized by the people that choose our tires because they’re proven winners in extreme conditions." Each year, BFGoodrich teams compete on a variety of tires, including the BFGoodrich® All-Terrain T/A®KO tire, BFGoodrich® Baja T/A® tire and BFGoodrich® Baja T/A®KR tire. 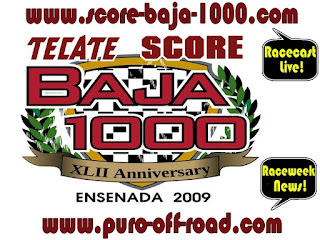 During recent years, teams driving on BFGoodrich® Baja T/A® tires have been near perfect in the Baja 1000. In 2008, BFGoodrich Tires took victories in 12 of the competing classes, including the overall title by Roger Norman and Larry Roeseler in a Trophy-Truck. BFGoodrich Tires also supported the entire Baja Challenge Class with Mud-Terrain T/A®KM2 tires. "Ask any driver who was down in Baja last year (2008) and they will tell you that while not the longest course in race history, the 631-mile loop course was as demanding on the racers, equipment and tires as ever before," said Frank DeAngelo, off-road motorsports manager for BFGoodrich Tires. "This year’s course is set up similarly to last year’s, but they’ve added an extra 40 miles to the course for good measure." BFGoodrich Tires will be lending pit and communications support to teams through its fleet of off-road motorsports vehicles. This immense undertaking involves more than 250 off-road enthusiasts and volunteers each year who are passionate about BFGoodrich and donate their time to help make the race an overwhelming success.